Smallpox research. 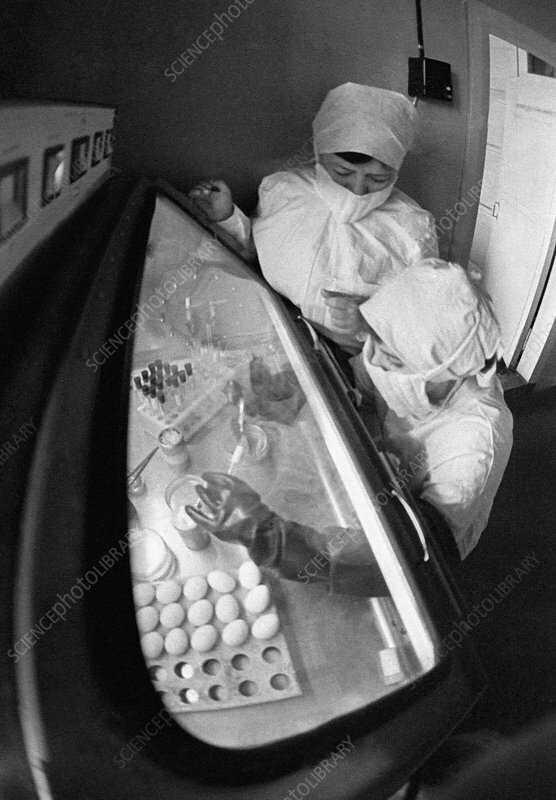 Soviet laboratory assistants at the State Research Institute for Viral Preparations, Moscow, Russia, studying the smallpox virus (Variola). Smallpox is an infectious viral disease that killed tens of thousands every year before it was eradicated by a worldwide vaccination program in the 1960s and 1970s. From 1983, the only remaining sources of the virus were stocks kept at two laboratories, this one in Moscow, Russia, and the other at the Centers for Disease Control and Prevention in Atlanta, Georgia, USA. In 1994, the Moscow repository was moved to Siberia. Photographed in 1980.